The AMCAS personal statement is an important part of your application. The key word here is “personal”: your essay should convey your unique journey in deciding to become a physician, what you have done to support this interest, any hardships or handicaps you may have encountered, and your background and personality. Your goal is to convince the reviewer that you are sincere about wanting to be a doctor, that your background suggests you have the ability and stamina to go the distance, and that you would be a competent and positive addition to his or her incoming medical school class. In other words, you want to impress the reviewer enough to be invited to interview. Because writing such an essay isn’t easy, it’s important to start early by brainstorming and planning your PS with the goal of submitting your application as close to the AMCAS opening date (early June) as possible because most schools extend interview invitations on a rolling basis. One way to begin work on your personal statement is by making a list of significant experiences in your life, whether personal, academic, or extracurricular, and how they influenced your development. Also think about what you learned from these experiences or how they moved you towards your goal of becoming a physician and in what way writing about them might flow together chronologically to make a coherent story. At this point you might want to make an outline and decide which of these experiences—or something entirely different—you want to use as an introduction to your essay. It is important for this opening paragraph to capture the reader’s attention and keep him reading. The most effective way to do this often is with an anecdote that concludes with a lesson you learned or that was pivotal in your career decision. It’s especially nice if you can circle back to that anecdote in your conclusion. Need more help with your AMCAS personal statement? Sign up for a FREE 15 minute advising session. In deciding what activities to address in your personal statement, keep in mind that you also will be preparing application entries (which reviewers typically read first) so you don’t need to cover all your activities. You will want to choose those that best illustrate the points you make in your essay about your interests and strengths as a candidate. It also is okay—and almost inevitable—that your personal statement and your application entries address some of the same activities. When you have this kind of overlap, try to write about a different aspect of the activity in each of the two documents and be careful not to use exactly the same language and phraseology in writing your descriptions. Should other people review your essay? 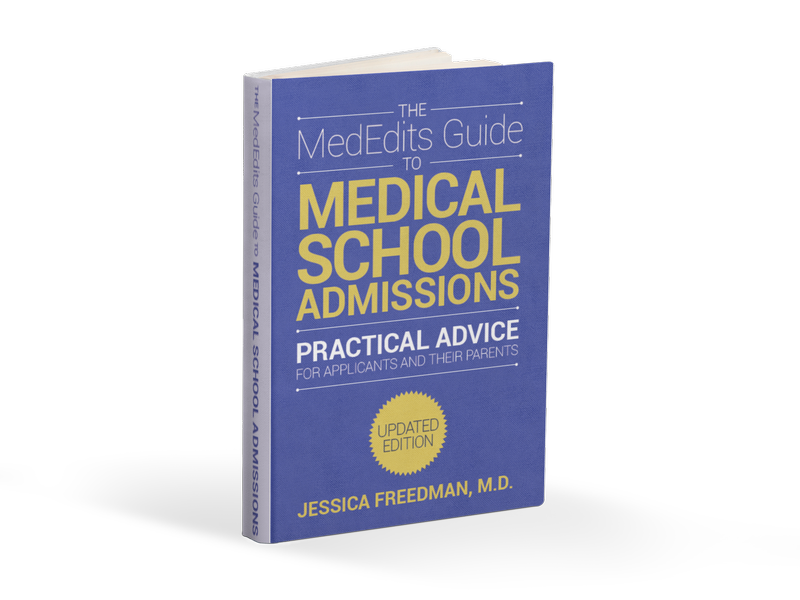 This can be valuable, but it also can be confusing and unhelpful because your mother, best friend, or even a practicing physician may not know how best to evaluate your essay, and these individuals surely will each have something different to say. We suggest getting just a few opinions from those whose views you value—such as your medical advisor– and doing so early in the process and then relying on your own good judgment. Don’t make negative comments about medical practices you have observed. Don’t “tell” the reader about your positive personal qualities; “show” her by describing what you did in a particular situation. Don’t write that you have decided on medicine as a career because you “want to serve others.” Not only is this something of a cliché, but it is too general. Teachers, social workers and other professionals “serve others”; you need to be specific as to what about medicine makes this the field for you. Don’t “preach to the choir” by telling the reader what, as a physician, she already knows. This undesirable material typically begins with “The practice of medicine requires….” or something similar. Don’t explain why you are not interested in another field, perhaps something you once considered. Keep your focus on medicine. After the introductory paragraph, which can be based on something that happened recently or some time ago, you can go back in time and develop the rest of your essay in as chronologic a manner as possible, which helps the reader follow your story. Keep in mind that you have a maximum of 5,300 characters (with spaces; hard returns count as two spaces). But don’t feel that you have to “use up” all the available characters. Instead, concentrate on telling a story, giving it flow, writing good transitions, and making sure that everything you write about is inherent to the overall narrative. At the same time, you should avoid writing a personal statement of fewer than about 4,300 characters, which could give the impression that you are not willing to give the essay the attention it merits. Of course you want your personal statement to be as well written as possible. First and foremost, be certain that your spelling and grammar are flawless. Many grammar books are available for reference if you are unsure about something, or you might restructure any questionable sentence in a different way. Use active voice whenever possible. For example, instead of writing “The patient was prescribed medication,” make it, “The physician prescribed medication for the patient.” You undoubtedly will review your finished essay several times; allowing time between these reviews will give you a fresh view and make any mistakes, wordiness, or redundancies stand out. Also be sure to proofread the document several times, ideally with a good night’s sleep between each read. And set up the essay in plain text because the AMCAS application may not allow excessive text formatting. 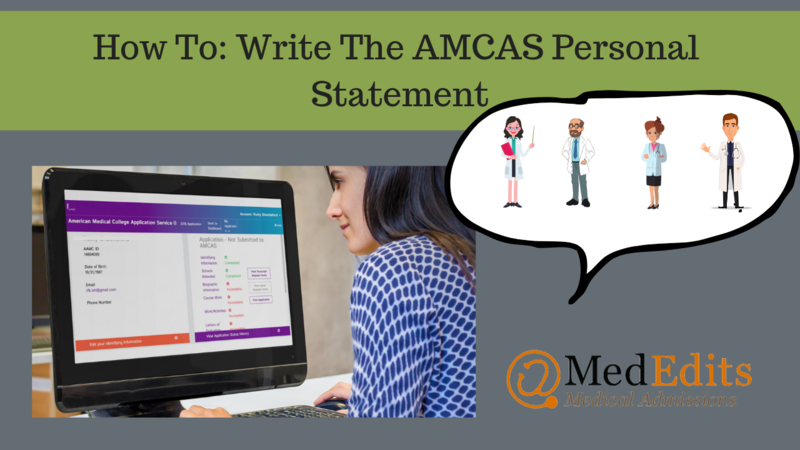 If you are applying to osteopathic as well as allopathic medical schools be aware that personal statement requirements are not the same for AMCAS and AACOMAS. Instead of the 5,300 character maximum you are allowed for the AMCAS personal statement, you will need to limit yourself to 4,500 characters (with spaces) for AACOMAS. Some applicants try just to cut back their AMCAS essay, but this generally results in a choppy, ineffective document. Further, for the AACOMAS essay, it is imperative to discuss your exposure to osteopathic medicine and why you find it attractive. The bottom line here is that it is best to start from scratch when you develop your AACOMAS essay though it and the AMCAS personal statement may have many elements in common. If all this sounds rather daunting—it is! But if you begin early, work hard, and stay organized you can pull it off. And, of course, we are available to advise you.